So, there I was, with Friend T at a thrift store perusing the usual mish-mash assortment of books. The ratty Michener and garishly colored Daniel Steele books lined the shelves, and I was about to leave the low-rent area of used books when suddenly I spotted it--the old distinguished cathedral there in the middle of the strip malls. The slender orange binding, the plaid cover bespoke certain air of jaunty 50's dignity. 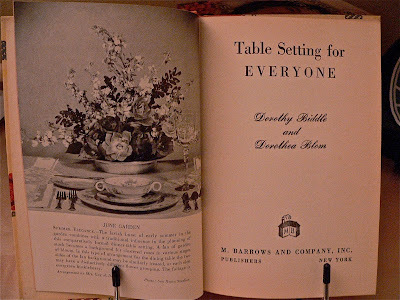 I pulled Table Setting for Everyone by Biddle and Blom off the shelf and opened the front over. 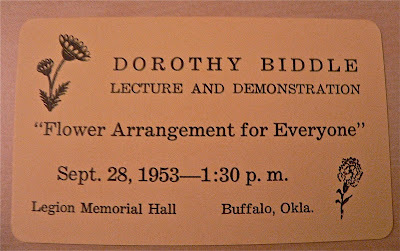 Inside the front page was the inscription by the author Dorothy Biddle herself. 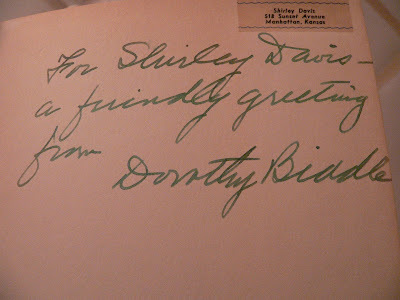 "For Shirley Davis--a friendly greeting from Dorothy Biddle." There in the upper left hand corner was an address label for Shirley Davis, 518 Sunset Avenue, Manhattan, Kansas. Hummmm....Manhattan was where I went to college and lived for four years. 518 Sunset Avenue was about three houses down from where HOB lived while in college. I explained this quickly to Friend T who said, "Well, I guess you sort of have to have that book." Buy inexpensive dishes and glasses until you get acquainted with yourself. They are not so durable as the costly, but if they fail to represent your desires, you will not feel that you have burdened yourself with the patterns that may become an abomination to you in a dozen years hence. Lackadaisically or overcome with momentary enthusiasms, women often seal their fate to expensive dishes and glasses that have a personality not in sympathy with their own natures. Now Betty has been known to set a good-looking table. Did I not at one time cover the table with Astroturf for a picnic-like atmosphere for my Orange Food Only party? For a friend's Bon Voyage party I placed a world map accompanied by a collect of monies of the world under a clear plastic tablecloth. 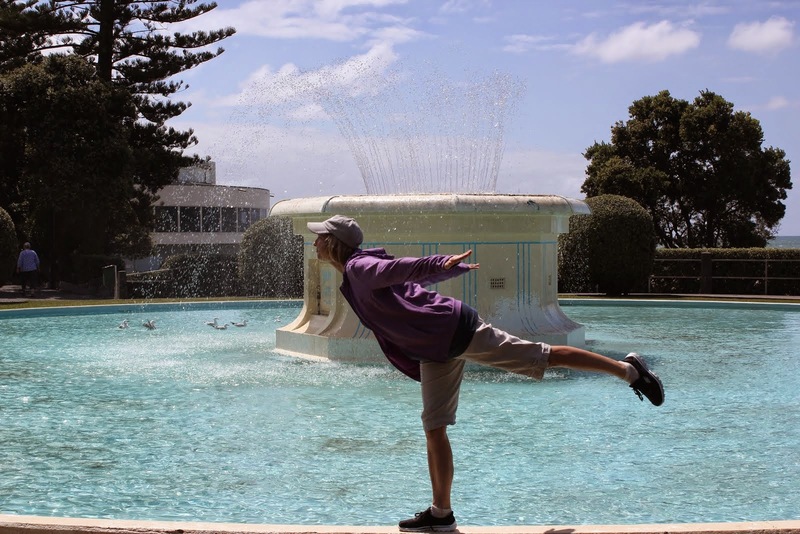 How tony! How chic! How absolutely global! Mint, anyone? Mint? And let us never forget the traditional "Yam Bird" for a Thanksgiving centerpiece in which a yam is carefully selected for its bird-like appearance, placed upon wires woven together to resemble legs and given yellow pushpins for eyes. Just the right shape of yam can give your Yam Bird that nearly airborne appearance that will have your guests continually snapping their heads toward the bird to see if lift-off has indeed occurred. Though the Yam Bird was not featured in this book, (????!!!!!????) I did learn about creating a Nautical theme, a Garden table, a Lilac Luncheon, Oriental Springtime and a Jeweled dinner. I leaned about individuality in salts and peppers, sufficient candlelight and the mechanics of flower arrangements. Cigarette flowers was what we called one exhibitor's inspiration. She used a white cloth with gay red plates, a red plastic bowl in the center, and springing from this many stiff stems of the coral-red spider lily which grows wild in the south. In the midst of these light globes of cheery red were groups of three cigarettes, strung lengthwise on wires forming "flowers" that swayed as easily as nature's own blossoms. All these were held in place in a lump of floral clay fastened to the bottom of the bowl. Betty just may have to go get a pack of ciggies, just to recreate this look for my next dinner party. By enhancing the occasions when you break bread together, you are adding to the richness of living. :) This spoke to my heart. Nothing compares to the satisfaction of setting a fine, welcoming table! I smell a blue ribbon at next year's county fair! Maybe something self-referential, with the book as centerpiece.